• Available in 8”, 15” and 20” heat seal lengths - high speed validatable medical constant heat for Tyvek pouches for medical devices. • 100% validatable and calibratable across all seal parameters, ISO 11607, CE Compliant. 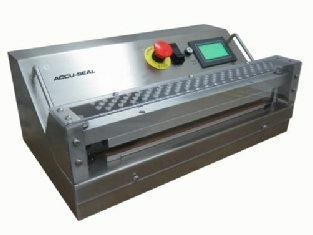 • Fully lock out protected alarmed digital process control with +/- 1 degree accuracy. • The high speed PLC with LCD touch screen HMI provides the confidence all process parameters are maintained Seal-to-Seal. • External verification ports offer ease of calibration.